The all-new AgriFlo Series 3 Irrigation Flow Monitor, available from Envco Environmental Equipment , has been designed for functional field use by both irrigators and irrigation supply companies. A dual password system allows irrigator access to flow data, without compromising the integrity of the meter. 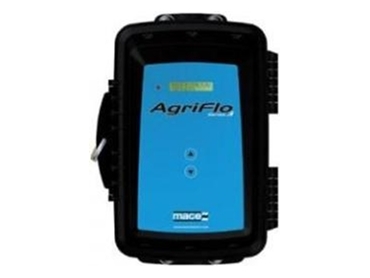 The AgriFlo Series 3 Irrigation Flow Monitor case can be padlocked for added security. This irrigation flow monitor gives better than 2% accuracy, even at stream velocities of up to 8m per second. MACE Doppler instruments transmit an ultrasonic (sound) wave into the flow. This sound wave is reflected by acoustically reflective particles (e.g. air bubbles, suspended solids) and the instrument detects the reflected frequencies. The difference between the transmitted frequency and the received frequencies is directly proportional to the velocity of the stream flow. In full or partially full pipes, the velocity of the stream flow varies markedly across the cross-section of the pipe. Typically, velocity is zero along the wall of the pipe and increases to a maximum at or about the centre of the pipe. MACE Doppler instruments receive reflected frequencies from particles moving at these different velocities. The greater the area of flow moving at a particular velocity, the greater the number of reflections with the respective frequency shift. The average velocity of the stream is therefore calculated by averaging those frequency reflections received across the whole stream profile. Application software FloCom+ PC software for system configuration, data downloading and velocity profile testing. Method: Ceramic pressure transducer with large flat sensing diaphragm which allows straight, undeflected flow over the sensing area to reduce drawdown effects at high stream velocities, and provides for self cleaning with an Alumina ceramic surface.